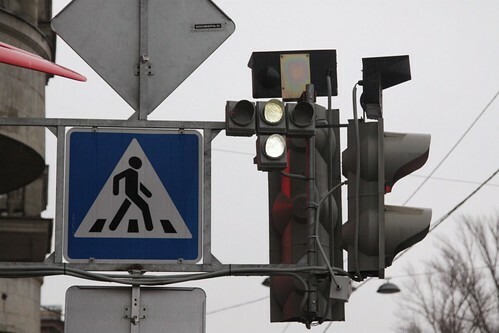 I found this example of a tram only traffic signal in Saint Petersburg. And Wikipedia features this example from Moscow. So what do these signals mean to tram drivers? The Пра́вила доро́жного движе́ния (ПДД) (“rules of the road”) for the Russian Federation have this to say. To control the movement of trams as well as other public transport vehicles in a dedicated lane, single colour signal lights can be used, featuring four lunar white lamps arranged in a ‘T’. The movement is permitted only when the both the lower signal and one or more of the upper, the left of which allows movement to the left, the middle – straight, right – to the right. If only the top three signal are included, then movement is prohibited. An simple design that doesn’t distract motorists, and the trio of ‘stop’ lamps make it virtually failsafe against a single failed globe. 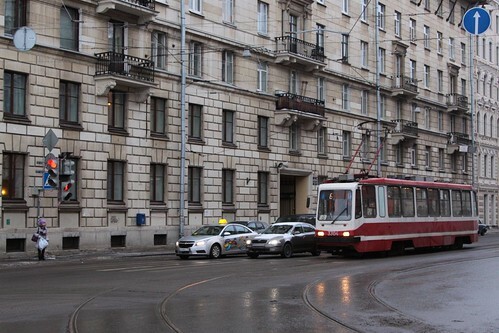 This entry was posted in Trams and tagged Moscow, rail operations, rail signalling, Russia. Bookmark the permalink.